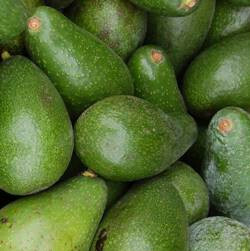 Hass Avocado: The Hass avocado is dark-colored with a rough and bumpy skin. Most other varieties are more green and have smoother skin. Signs of ripeness differ by variety. Hass varieties will turn black when ripe while other varieties remain green. All varieties yield to gentle pressure when ripe. Zutano Avocado: This avocado is easily recognized by its shiny, yellow-green skin. It has moderate peel ease and a light avocado taste. 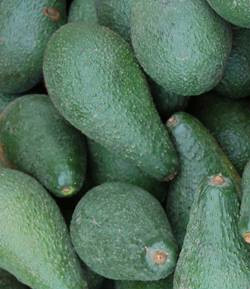 Bacon Avocado: Has an oval-shape and smooth, thin skin that is dark green in color with faint speckles throughout. Their flesh is pale yellow-green, with a buttery and creamy texture. Fuerte Avocado: Pear shaped with a medium seed and thin skin that peels very easily. The skin is smooth dark green and flesh is creamy and pale green.